Choosing the right safe for your small business is an important decision. The level of security and quality are two of the most important features when choosing a safe. Every business has different needs, so it is essential to understand the priorities for your business to find the right safe. Consider this guide to compare safes for Seattle small business owners. One the first aspects of a safe to consider is the size. From 0.3 cubic feet and up, safes come in a variety of sizes. The right safe will be large enough to fit everything you plan to store in it, but not too small that it cannot accommodate everything necessary. Plan out what you want to save in your safe and measure it to get an idea of how big of a safe you need for your business. Shelves, door trays, and key hooks make it easy to organize items inside of your safe. Utilizing these storage options allows for quick retrieval of items. Consider what things you plan to store in your safe when looking at interior storage options. For instance, if you plan to store large or oversize items built-in shelves may be in the way. The lock defines the security of a safe. From locks that can be secured with a key, a preset or programmable code or biometric fingerprint scanners all provide different types of security. Safes that feature several types of locks are more secure. Should you be locked out of a safe, a locksmith can help you gain entry. Traditional locks that engage with a key are a tried and true system. The advantage of a key lock is that only people trusted with a key can open the safe. The disadvantage is that if a key is lost or misplaced the security is compromised. If copies are made of keys or employees, do not return their keys before leaving the company that can render a safe insecure. The combination and programmable locks require a code to open. The code is secure and can be given to multiple employees who require access to the safe. But the code is only useful if you can remember it. And it can be tempting to write the code down, but the security of the safe is compromised if the code is documented and accessible. The ability to reprogram the code makes the safe adaptable and ensures the safe remains secure. Biometric fingerprint readers open with literally the press of a finger. Quickly gaining access can be beneficial if you need to open the safe immediately. Some safes equipped with fingerprint readers allow for multiple fingerprints to be programmed. This allows you to give access just to the necessary employees and there is no need to worry about keys being copied or the code being shared. The box of a safe is typically made from thick steel that is resistant to tampering. 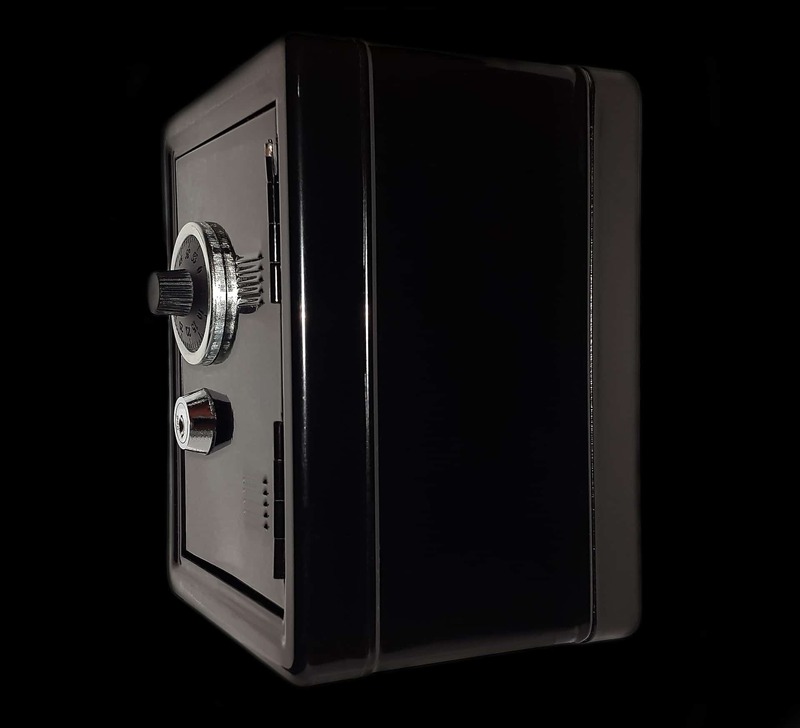 Most safes feature a mild steel exterior that stands up to blunt force for added security. Extra-large bolts or additional bolts add to the durability of the construction and help keep the door in place when the lock is engaged. The hinges contribute to the overall security of a safe. Pry-resistant hinges withstand efforts to remove the door. Hinges located inside the door make a safe more secure and prevent tampering. Lightweight safes can easily be moved for any reason. A compact and lightweight safe can be stored in a filing cabinet or desk drawer, so it is out of sight. In the event of a fire or other issue, a lightweight safe can be removed from the building. A significant disadvantage of lightweight safes is that criminals can easily carry them off, too. Safes equipped with mounting brackets allow it to be secured to a floor or wall. This ensures the entire safe cannot be stolen, and it will securely stay put. Diversion safes look like something other than a safe. It may look like a book or even a clock. The safe is intended to be inconspicuous. Since it does not look like safe items can be secured in plain site. The secretive design lends to the level of security. Diversion safes are often small, so storage space is limited. Features such as being waterproof or fireproof further safeguard the items stored inside. Waterproof safes can keep items dry in the event of a flood, or even if the sprinkler system is engaged. Fireproof safes provide peace of mind that important documents and other items secured within will make it through a fire. Understanding what your business needs will help you navigate the options to find the right safe. The size and the type of locking mechanism are important, but other features, such as water- or fire-resistance can further protect valuables.